So it was just an hour and two cups of tea later when the RMS Dragon Fire descended into Amritsar. It was easy to pinpoint the Golden Temple from the smoke billowing out of the surrounding buildings. "No point in sneaking in." The Grand Arbiter observed. Drawing closer, the sounds of battle were easily heard. As they passed overhead, the horrific scene was laid out before them. Although the undead hoards of the Caffeinatti had seized the outer buildings, the temple itself sat within a manmade lake, only accessed by a narrow bridge. Sikh warriors had been valiantly holding this bridge for hours, as was witnessed by the blood that covered the bridge and dripped into the pool. The RMS Dragon Fire landed in the courtyard outside the temple complex and the crew, along with Madam Askew's Entourage, poured out, the Madam herself leading the charge, saber in one hand and a blaster in the other. "For the Queen and Saint George! Die you saurian savages!" She yelled at the dinosaurs that had surrounded the cruiser as it had landed. They might have been mindless dead, but some sense of self-preservation made them retreat from the fearsome sight before them. It was fortunate that the larger dinosaurs were in the fields south of the city to destroy the clippers, and only the smaller ones were left here to attack the temple. However, that did mean the presence of some testy Velociraptors, who were still quick enough to cause trouble for the human attackers. We know that as the days get warmer, there are some of you that will want your tea over ice. So, this month, we would like to share a basic formula for iced tea. 1. Start by using cooled spring or purified water. 2. Bring said water to an appropriate temperature; say 210 degrees Fahrenheit for black teas. 3. Once the water is hot enough, add 2 teaspoons (6-10 grams) of tea for every 8-10 ounces of water. 4. While you wait for your tea to steep, acquire a tall glass and fill it up about 1/2 to 3/4 of the way with ice. 5. When the tea is done steeping (3-5 minutes) pour the brew over the ice and enjoy. When we left our intrepid crew, they had been warned by Madam Askew and her Temporal Entourage of a dastardly plan, by the Caffeinatti and Rabrax the Unspeakable, to waylay the armada of tea clippers on their way from Darjeeling to London. "So we have a dinosaur necromancer and his army of the undead before us, and no choice but to forge ahead. Does anyone have a cunning plan to get us out of this pickle?" The Lady asked. The room was oddly quiet. "Well, there is one possibility." Auntie Duchess ventured. "I believe that this in the time of year that our good friend Grandma Gao visits the Dalai Lama for their annual croquette weekend. She's very close and always brings her army with her. It couldn't hurt to ask." Madame Askew almost collapsed on the chaise lounge, turning to look out the forward sitting room window of the RMS Dragon Fire. Outside, she could see the fleet of tea clipper dirigibles that the Dragon Fire was escorting from India to London. "The fate of the entire empire is at stake! We must act at once!" She declared as the Grand Arbiter poured a cup of tea for her. She tossed back the tea in a single shot. "Good Gods, man, there wasn't a drop of whisky in that cup! This is no time for unadulterated beverages." The Duchess grabbed the nearest decanter and swiftly poured the Madam a stiff drink. "There you go, dear. Now tell us what's going on." Auntie Duchess had a soft spot for the Madam ever since she had pushed one of the Duchess' nephews into the Indian Ocean from 500 feet up. He had survived and the Duchess still told the story with relish. Madam Askew visibly centered herself. "My temporal entourage and I were sent by the Queen to investigate a possible temporal rift. The Caffeinatti have been up to some pretty heinous fu-- nonsense recently, and the ether scouts noticed a disturbance around the Punjab, specifically Amritsar. We went directly to the Golden Temple, as one does, and what we found shook me to the core." The Grand Arbiter produced a fan and started to wave it over the half-prone Madam. "The Caffeinatti have created a temporal rift and have brought in sentient dinosaurs to help them with their evil plans. Their leader is called Rabrax the Unspeakable, and...he is...a dinosaur nercomancer." The Tea Adventurers' Guild is an eclectic lot. Not only do our members originate from a wide variety of places, but we continue to venture into parts both known and otherwise, and collect items, ideas, and customs along the way. As a result, the kitchen of the RMS Dragon Fire is host to all manner of hybridization and experimentation. The Professor, in particular, gets real joy from a perfect blend or twist. These cookies are a prime example of one such reinterpretation that has become quite a hit with all members lucky enough to snap one up before they all disappear. A cannoli? A cookie? Divine tasting? Perfect with a cup of tea? Well...yes. In a large mixing bowl, cream the butter and sugar together with an electric mixer until light and fluffy. Mix in the eggs, then the ricotta cheese until well combined. Incorporate the vanilla extract, cinnamon, and fresh orange zest. Next, mix in the baking powder​, baking soda, and salt until well combined. Mix in the flour. Stir in the pistachios and 1 cup of chocolate chips. Cover and refrigerate the dough for at least 1 hour. Preheat oven to 375 degrees Fahrenheit. Line baking sheets with parchment paper or lightly grease. 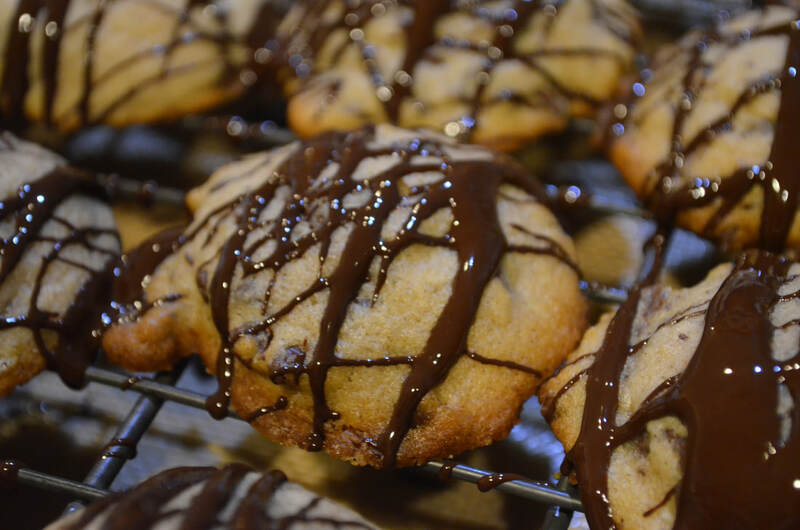 Using a medium cookie scoop or spoon, drop about 1 1/2 tablespoons of cookie dough for each cookie, leaving about 2 inches between each cookie and the next. Bake cookies at 375 degrees Fahrenheit for about 8-11 minutes or until golden brown around the edges. Cool slightly, then move to wire racks to cool completely. Microwave remaining chocolate chips in 20 second intervals on high in a small microwave safe bowl, stirring between intervals until melted and smooth. Spoon melted chocolate into a small resealable bag, clip one small corner off the bag, and drizzle melted chocolate over the cookies. Let cool for chocolate to set. Original recipe courtesy of the Snappy Gourmet: ​https://snappygourmet.com/cannoli-cookies-recipe/ You should check out her site for many other delicious recipes.